Why defend Oblivion? Oblivion doesn’t need any sort of defense—it’s a big, very loud sci-fi flick that has made more than enough money already and can only be shameless Hollywood product that meant to indulge what little of your brain it can why throwing as much trash onto the screen possible. Right? Big products like this with big studios and big stars only care about grabbing paychecks and moving onto the next shameless project. Studios can’t care about craft. That’s a lot of the rhetoric I’ve seen thrown around Oblivion, a film that I feel the need to defend, not just as something that I found quite entertaining, but also something that I think perceptions of what it aspires to be often cloud the judgment of viewers. Oblivion is far from perfect—it actually has numerous issues that keep it from being anything truly worth upholding as a major work—but the reason it needs defense is that once one draws a party line, one begins to see everything in the film as a problem. One begins to point the moments of interest and simply call them bad instead of thinking through them. Yes, Oblivion has good things and bad things—but it also has interesting things worth discussing, and to discuss their meaning, their narrative function, and, yes, their artistry is what I find why I need to defend Oblivion—not for the sake of giving the film more of an audience, but to hope that every film can get a proper due, no matter who or what is behind it. It’s funny to see what you pick up from conversations on the Internet. If I don’t immediately see a film and get in on the “cultural conversation” from the get go, I find myself only skimming the oddest of details. And since I don’t really watch trailers, I really have no idea what to expect with these things. So here’s what I knew going into Oblivion: Tom Cruise, Giants Stadium, less twirling from Olga Kurlyenko than in To The Wonder, big budget version of Moon, and a terrible voice over that starts the movie. I hated Tron: Legacy with a huge passion, and originally had no interest in checking out Joseph Kosinski’s follow up, which haunted me every day to work on the subway with it’s slick gray posters and generic sounding title. But some people whose opinions I respect had enough kind words to say about it, and since I needed a break from the half dozen or so African films I watched last week, I decided this could be a palette cleanser. So I went to confront this behemoth on a (quite packed) late night Wednesday screening in Time Square. 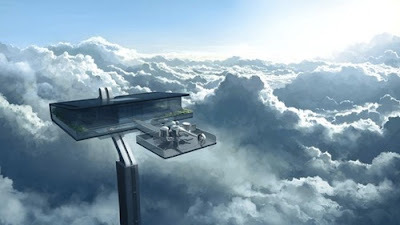 From the get go, Oblivion seriously impressed me with its visuals in a way Tron: Legacy never did. Tron: Legacy was as sterile as its characters. A lot of slick lights that run in directions, but no direction toward them. Immediately, Oblivion gives a strong sense of the world its characters inhabit—one defined by empty spaces along grand planes of space. Kosinski, as Vadim Rizov astutely pointed me to, trained as an architect and it shows in his construction of space. It’s hard not to think of the work of Paul W.S. Anderson when watching Oblivion, except everything is blown up to a massive scale that has a stronger authenticity than Anderson’s cheesy backdrops (which have their own special pleasure to them). Like Anderson, Kosinski works in symmetrical lines, hard diagonals, and spherical movements. If I can create a word, he’s a dimensonalist. He clearly thinks in terms of a space first—what sort of environment to these objects exist in? What can the characters see and what can’t they see? Where are the planes of action?—and then best thinks how to play within those spaces. This frees his cinematic movements to have a certain giddy intelligence to them. When Jack’s spaceship launches off its sky platform and does a U-turn, Kosinski camera does a great 180-degree movement that clearly thinks about what shot will best show how these characters think through their spaces. And a great late action sequence between three spherical drones and a band of humans uses the cavern space to work in all three dimensions, using the camera to constantly reorient new planes of action to think through. While a good portion of critics have given Oblivion that necessary praise, it follows that the film is apart from its visuals a big soulless science fiction flick that is only derivative of every other science fiction film ever made. 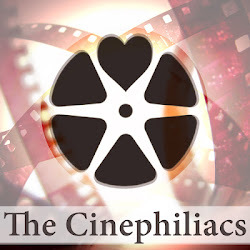 More on that second point later, but I think one of the major issues with the film is the unfortunate score by M83, which suffers from a disease I believe is called HanZimmerphilia. A gorgeous sequence in which Jack and his wife swim in a pool (a grand design that again emphasizes the spaces of foreground, background, and verticality) is more or less botched thanks to the soundtrack’s attempts to make one FEEL things. 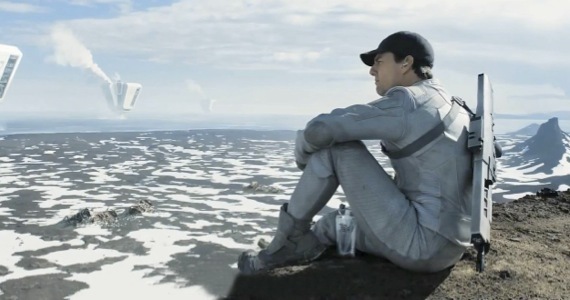 Oblivion peaks during its first hour where it endlessly sets up a world of emptiness, where one could imagine it playing almost like a silent film, allowing it to have a strong introspection. The score unfortunately drowns out this reflection, especially during the film’s unbearably long 20-minute climax, a promise of human redemption than the interesting questions it poses throughout the rest of its running time. There’s also a great detail I learned via reading an interview with the DP, Claudio Miranda (someone with a lot of interest in digital images, who is certainly not here to make a quick buck and head off to something serious), in American Cinematographer—their fantastic flat, a beautiful, right-angled, and vacuous location, was set up with real time monitors that projected the clouds onto the various windows instead of simply using a blue screen. Mirando explains that it was “liberating for Tom and the other actors because they weren’t acting in a blue void; they were experiencing the environment in a very real way” So while Miranda used it as a way to help him light (he could use the actual light of the screens instead of use the guess work of blue screens), the effect also brings back into the idea of characters acting via simulation. These people can’t help but run through their lives as video game cultures, and are programmed to do so via repeated gestures and vocal articulations. Maybe I find this more fascinating than I should, because a lot of Oblivion’s main themes are otherwise somewhat standard questions of science fiction relating to the function of memory, avatars, cyber-synthetic-humanoid relationships, and general searching for the spirit humanity in places that are none. Some of this is perhaps the repetition of films like A.I: Artificial Intelligence, Déjà Vu, Blade Runner, and many more, but I also found some of it refreshing within Kosinski emotional spectrum. 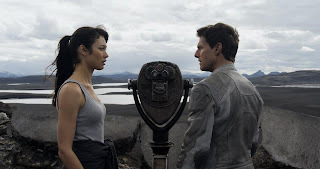 The fact is that Oblivion has two great actors in Tom Cruise and Andrea Riseborough, who do have chemistry and bring a certain dimensional aspect to the characters they inhabit. Cruise’s silly but soulful monologue about a Superbowl he never went to is a great character moment that only the superstar’s personal affect for sincerity can really sell. And Riseborough has something in her stares, especially as she waits by the glass door, debating what to make of her husband, that I found emotionally unique. Konsinski does have some intelligence in the way he shoots these things—a close-up on two hands holding is a great moment that emphasizes the character traits, and there’s even a really nice use of a shot reverse shot with intentionally shallow focus that shows the separation of two characters slowly rectifying their differences. There isn’t a lot of character work going on here, but I did find it gave me a reason to not write off its various science fiction references as shallow, only a way to work through the various interests of Konsinski. I’m not going to lie that there are elements in Oblivion that are down right awful: its invocation of Thomas Babington Macaulay feels inspired by a Google Books search for “Roman Empire.” The opening voice over is not particularly offensive except for the fact it is almost repeated verbatim about 45 minutes later—the film's major relay of exposition is simply too slow and too repetitive. And the last twenty minutes, which intercut between the slowest moving sequence ever and a flashback that has to explain every last detail that has been raised, could be thrown out all together (though the film also poses in its final minutes a form of collective meme transference that could be a film in its own right). But what I’ve attempted to do in this piece is not defend Oblivion per say but give some of its more interesting features a little more consideration. 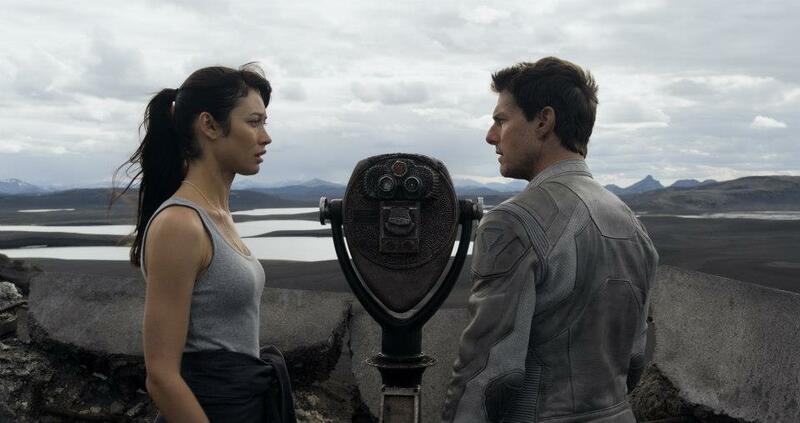 Does it matter if Oblivion is shameless Hollywood corporate product? I’m not really sure, but I had fun watching and writing about it, so I’ll take it how it is. 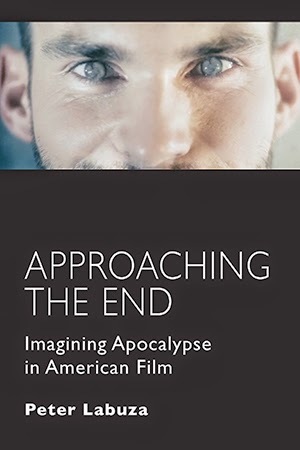 All of you should really be reading American Cinematographer. Quote taken from May 2013 issue, page 38. "Tron: Legacy was sterile as its characters."